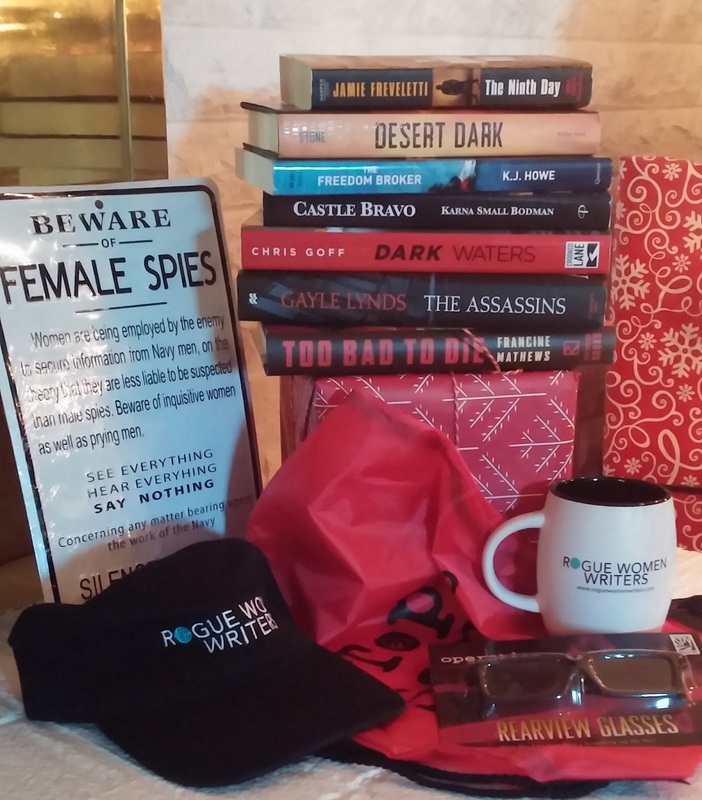 Rogue Women Writers: GIVEAWAY — PASS IT ON! AMERICA’S TOP TEN NEW YEAR’S RESOLUTIONS! GIVEAWAY — PASS IT ON! To receive great stories, join our mailing list here! Enter your email in the box on the left. To kick off January 2017 and celebrate just over 6 months of the Rogue Women Writers’ Blog, we are hosting a GIVEAWAY! If you’ve been following us, you know we are a group of eight authors of espionage, intrigue, and international thrillers who blog on all things cloak and dagger. As we ring in the New Year, the Rogues will be blogging about Resolutions, and we’d love for you to share yours with us. From now until Tuesday, January 31st post your answer to this question: What’s your #1 New Year’s Resolution?, on our Blog site, and be entered into a random drawing to win a spy bag full of books and goodies. Plus we invite you to subscribe to our mailing list by using the form below and to follow our blog by using one of the two choices in the sidebar — either by email or RSS feed. THE PRIZES: Signed copies of The Assassins by Gayle Lynds, Too Bad to Die by Francine Mathews, Desert Dark by Sonja Stone, Dark Waters by Chris Goff, The Ninth Day by Jamie Freveletti, and Castle Bravo by Karna Bodman; The Freedom Broker ARC by K.J. Howe; plus, a replica of a WWII “Beware of Female Spies” sign, one ROGUE WOMEN WRITERS baseball cap; one ROGUE WOMEN WRITERS coffee mug, and Spy™ "rearview" glasses, all packaged in a nylon TOP SECRET drawstring shoulder bag. Happy New Year! Thanks for logging in, and GOOD LUCK!! Not surprising for a writer, my number one resolution is to set AND KEEP a weekly word goal to finish a first draft in four months. First, come as close as possible to finishing my degree and secondly, learn how to fold a fitted sheet when doing laundry!! Also looking fwd to Dony Jay's next installment! My goal this year is to extend how far I can run. I started running two years ago (having never run before) to improve my health and to challenge myself. In 2016 I ran a 13.1k race, my furthest distance ever! Very proud of that accomplishment and now I want to add another mile or two. Let go of things I can't change. Read a book a week. Be more positive. Keep up my 10,000 step daily routine. I resolve to enjoy life everyday with activities such as crafting, hiking, reading, or traveling. Our family has lost a few members in 2016 and they were all too young. I want no regrets and want to try living to the fullest, in the moment. Peace. Build bookshelves for my big book collection. Remember to take care of myself as well as those I volunteer for and not with food!! Instead read favorite authors and find one new author to read each month. To be healthier and being positive in the new year! Working towards my goal! To have Courage! I read lots of books, but I rarely post reviews of the books I have read. My resolution to post (on Amazon and Goodreads) at least 18 reviews of books I have read. I post as "3 no 7" (it's a long story) so be sure to look for my reviews. My resolution is to not beat myself up over last years resolutions that I did not keep. I'm resolving to do something with my yard this year. Not just veggies. I want flowers! Get a publishing deal for my ninja mystery thriller! My number one resolution is to once again always tip waitstaff a minimum of $5, no matter how small the bill. My number one goal is to break 20:30 in a 5k race. My new years resolution is to try and better myself I also hope that people quit whining about things and be happy and bve respectful of others!!! My literary New Year's resolution is to diversify my reading in 2017 by completing Book Riot's Read Harder Challenge. My first resolution ever (but then I'm only 66) is to help my wife succeed in her new career as a yoga instructor and ayurvedic chef. With luck I'll actually get something published, too. My goals are to write a new television pilot and a new novel and to keep up the hunt for a new literary agent. My resolution is to read at least 2 books a month and quit smoking. my #1 New Years resolution is to continue recovery with daily walking and reading time. Finalize my novel for self-publishing. To work on one of my stories once a day and hopefully finish ONE before NaNoWriMo in November. Walk more and lose weight. Mine is to try to get my finances under control. I strive to live life to the fullest and to continue to read gret books! My #1 goal is to publish my first full-length novel. My goal is to be the first male member of the rogue women writers of espionage! This is because I know they will appreciate my non-fiction book about my experiences as a counterespionage officer during the Cold War. My book is titled "Rainy Street Stories". I certainly look forward to hearing from you! My number 1 resolution is to get healthier this year. Go to the Dr, eat more vegetables, walk more and sadly eat less chocolate. To donate blood more often. I have been fighting plantars fasciitis for more than a year and my goal is to kick it to the curb! I am eating healthier (Med diet, though not really dieting), trying to exercise more (plan to join a gym), and just get moving to lose weight. It's been a vicious cycle, need to exercise, then pay for it the next day when foot and back hurt! The only New Year's Resolution I've ever made that I've kept is to stop making New Year's Resolutions. However, I do have a goal of reading more this year, especially off my TBR shelves. My resolution for this year is to regularly post reviews of books I read. I read many, many books, but I have not been diligent about reviewing them, so my resolution is to post at least 2 reviews per month on Goodreads and/or Amazon. I want to live simpler and be happy in 2017. I want to mindfully think of each day as a new gift to celebrate being alive. I've made a bucket list of places to travel, people to cheer and my writing goals. I hope to give a dose of random kindness to someone else each day, if only to warm their heart and make them feel as alive as I do. I have put on my positive hat. Happy New Year to all of you who are reading this. My only resolution is to allow myself more flexibility in how I spend my time. I have so many interests and have neglected most of them for the last two years. Now have the time to fold them into my daily plans. My resolution? To remember as a full time caregiver, to breath and realize that I cannot control everything and to be a duck and let what I can't change, or control, roll off my back. To allow myself the luxury to just dive into my books and relax. My Number One New Years resolution is to be as healthy as I can. My second resolution is to read as many books as I can! "Now Is The New Later" I saw this on a shirt while Christmas shopping. It grabbed my attention and really stuck with this procrastinator in her 50s. Decided to make it my "goal" for 2017. To live and eat healthier. And to read more books!!! Well, I know it sounds contrived, but I hope to read more this year. Life sort of got in the way last year so I'm going to try to be more organized so I can have more free time. Try not to be so upset with politics and the USA election results. Go to the gym more often to get this excess weight off. My number one resolution is to stay as healthy as possible. Number one resolution is to live more fully in the moment & worry less about the future. Become more active and enjoy getting some exercise! To get into better health and read more books this year. My resolution for the new year is to maintain my 80-pound weight loss and remain a Size 0 to 2. I decided to take charge of my own health care and lose weight in order to reduce the need for visits to the doctor. I plan to stay trim and do what I can to take a continued, preventative approach to health care, especially given the rising costs of medical care. In addition, I plan to add a work-out regimen to my strict diet of non-processed foods, limited carbohydrates and a healthy daily balance of greens and protein. While I have several resolutions, I now have a new one; get caught up on this amazing blog! I have just discovered it today thanks to my husband meeting KJ at the Shot Show in Vegas about an hour ago. He text me immediately (as I am an aspiring spy writer), and I am SO excited to find about all these amazing women! I can hardly wait to sift through all of your information and experiences. Thank you, it's like Christmas all over again! Revel in the joy of writing! I make no new year's resolutions...just daily ones. The first and foremost is to do better today than I did yesterday. My resolution is to continue to try and be more kind. As well as to actually begin the book I have written in my head so many times. My resolution is to complete the final edits on my first novel and move onto the first draft of my second novel. To be a mentor to my 10 year old granddaughter who attended the DC march with her mother. And, to support my son, the feminist as he models for my grandson how to be a man. My resolution is to drink more water, read more and to stay positive...for myself, my family and friends and my students. My resolution is to drink more water and eat less sugar. My new years resolution is to just get better. Just relax and enjoy life more this year. I always resolve to complete my daily To-do list in ink...And any of the extra to-do in pencil! To read more without guilt! Though I am a man, I do read books on espionage and suspense. I love thrillers. So I signed up to receive the emails of Rogue Women. Pls don't rough me up for being a man, LOL. To spend less time online and more time on my reading & needlework. Oh yeah, on housework too.